We know that a lot of you love Tess Holliday, and at the same time some of you aren’t so keen. But there’s no denying that she’s a trailblazer when it comes to body positivity, and the world has had to sit up and take notice (the fashion world, anyway). She’s managed to achieve something that many people thought would never happen. 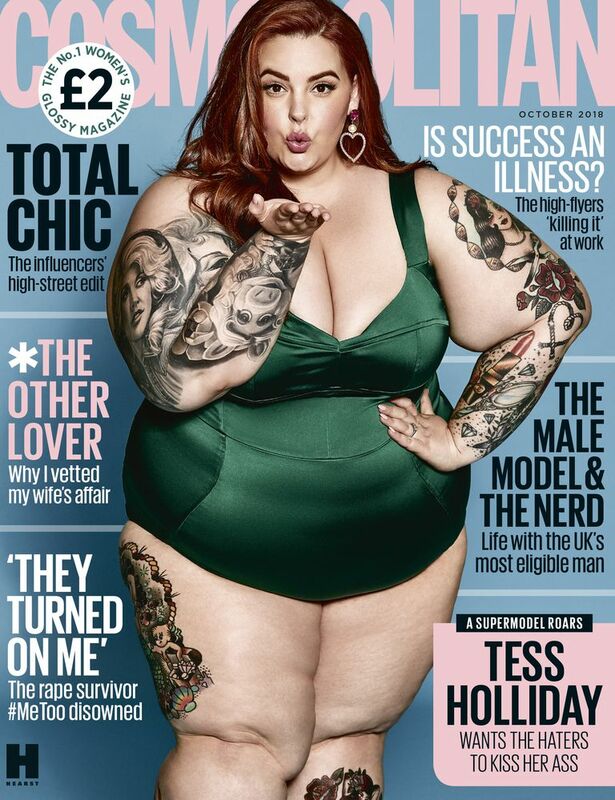 Not only is Tess Holliday on the front cover of UK Cosmopolitan this month, but gasp she’s got a full body shot. None of those coy head shots of her undeniably pretty face, but a full on, uncovered, tattoos on point swimsuit shot. From someone who grew up with headlines about celebrity weight loss – that’s amazing. I remember as a teen/early twenties and very impressionable young woman, seeing a then-famous pop star bleating about her “11 stone body hell” on the front of a magazine, and being around that weight myself, feeling terrible about it. I ended up in a slimming club being starved on 1000 calories a day. Not for long, I hasten to add, I think I was back on the Magnums within weeks. Even so, it stayed with me – I remember it now, over 25 years later. How refreshing it would have been to have seen more diverse bodies in magazines when I was younger. Back in the nineties it was Cindy, Naomi and Linda, the original supermodels, and they were gorgeous. Then, of course, Kate Moss came along and did it her way. But models got thinner, taller and more identikit as the decade closed, and throughout the early 2000s. It’s really only been the last ten years that plus-size models have been accepted onto catwalks. As someone who was influenced by magazines when it got to me the most, who has dieted on and off for most of her life and who stared longingly at the front covers of Cosmo, Elle and the like longingly for most of her teens and twenties, feeling like she was never going to be good enough because she couldn’t get her body to look like theirs…I say it’s fabulous and well done Cosmo. …and not just models, either. You can read the full interview with Tess Holliday in the October 2018 issue of Cosmopolitan UK, out today.